It’s the third Monday of the month and you know what that means…Secret Recipe Club reveals!!! I’m excited to share this month’s recipe with you! It comes from Sara who blogs at Cook with Sara. I feel like our styles of cooking are very similar, both perfect for sharing with our families and we both found our love of cooking from our relatives. I had a hard time picking out a recipe this month, since I was looking for sometime to make for dinner and tried to avoid desserts. 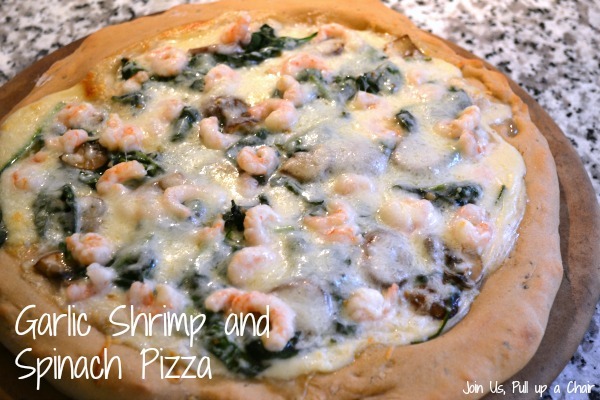 So after spending hours looking through recipes, I decided on Sara’s recipe for Garlicky Shrimp and Spinach Pizza. The pizza was really good and different. I made it for Ross and I on Friday night for dinner since I knew the kids would turn their noses up at it. Neither one like shrimp, so it wasn’t even worth the fight in getting them to try it. We’re still having dinner issues with Cooper – he now doesn’t like any of his favorites, mac & cheese, chicken nuggets – so I’m at a loss where to go from here. I used a different recipe for the crust – I made a whole wheat crust with a little Italian seasoning mixed in. I’ll just be sharing the sauce and toppings part of the recipe, so you can use whatever type of dough you prefer. Sara used a bread machine to make hers and incorporated mozzarella cheese and other seasonings. Preheat your oven to 425 degrees. Once ready, roll out your dough to the desired size of your pizza. Bake on a pizza stone for 10 to 12 minutes. Remove from oven until ready to top. While the crust is baking, prepare the sauce. Melt the tablespoon of butter in a small saucepan. Add in the flour, mustard, pepper and salt. Stir well and cook until it starts to bubble. Add in the milk and minced garlic. Continuously stir until the sauce becomes thick. Remove from the heat and add in the Parmesan cheese. Stir until the cheese has melted and pour over the pre-baked crust. In a medium pan, warm the olive oil over medium heat and then saute the sliced mushrooms and garlic for 2 minutes. Add the baby spinach and cook until the spinach has wilted. 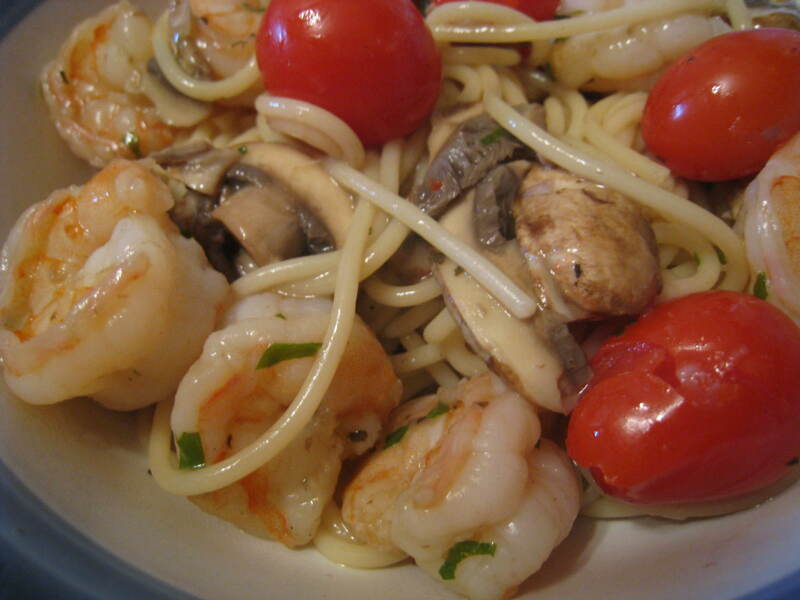 Place the toppings over the sauce and then add the shrimp and top with the shredded mozzarella. Bake for an additional 10 to 12 minutes until the cheese has melted. Check out all the other great recipes in this month’s reveal in the link below! Who else is glad this winter is over? Whew, it felt like it would never end! Storm after storm and bitter cold. I’m just glad all the snow is melted, the birds are chirping and the grass is getting green again! With this winter, I haven’t been cooking new recipes like I had previously done, but I’m trying to get back into a good groove and hoping with the access to fresh veggies soon, it will be easier! I loved this recipe! I’m a fan of risotto but my husband could leave it. I was hoping this recipe would change his mind, and I think it did! The original recipe says it serves 4, but I found it was more closer to 6-7 servings. Neither of my kids like it, but that was fine since I enjoyed it for lunch. 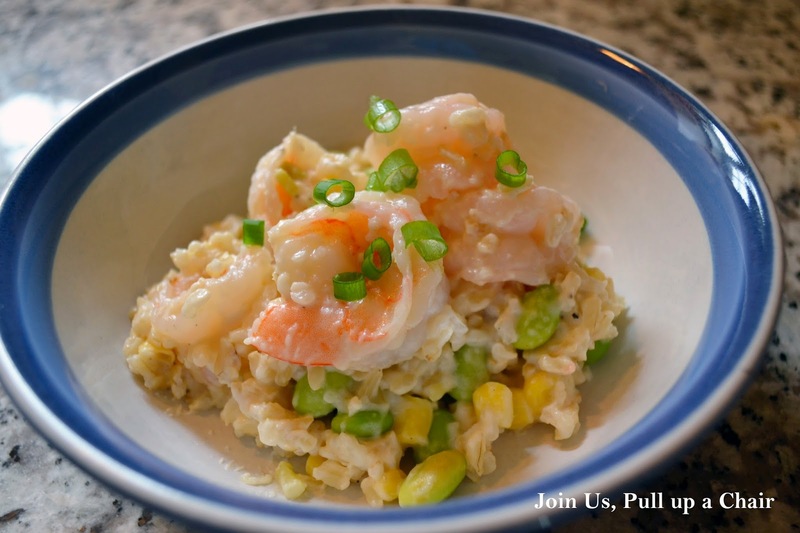 The risotto is made with instant brown rice and was so easy to make! The addition of cream cheese made it super creamy without a lot of extra calories (especially great since I gained a little weight over the winter). In a large skillet, heat the oil over medium heat. Add in the white part of the scallion and rice, stirring constantly for 1 minute. Add in the wine and cook until the majority of the wine has evaporated. Add the chicken stock and return to a boil. Reduce the heat, cover and simmer for 5 minutes. 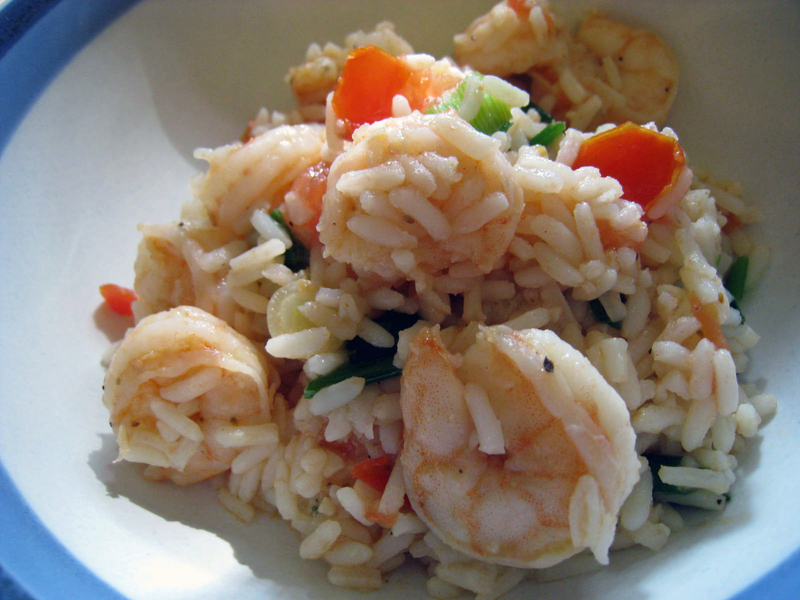 Place the raw shrimp on the rice and cover. Cook for 5-7 minutes until they’re completely cooked through. Stir in the frozen edamame, thawed corn and the pieces of cream cheese. Mix until completely incorporated. Continue cooking uncovered, stirring occasionally until the majority of the liquid is evaporated. Remove from heat and stir in the Parmesan cheese and season with fresh ground pepper. Divide into portions and top with the reserved scallion greens. I love ramen noodles, I know they’re so bad for you…but I still enjoy them every once in awhile. Plus they’re my go-to meal when I’m feeling sick. This soup was delicious. We all gobbled it up and I loved how quick and easy it was to make. It definitely took Ramen noodles to a whole new level. I’m thinking next time I’ll swap out the ramen for another thin noodle, like vermicelli to make it healthier. In a medium pot, heat the canola oil over medium heat. Add the onions and cook stirring occasionally until they’re soft and translucent. Add the broth and 1 tablespoon soy sauce, increase the heat to high and bring to a boil. Add the chopped spinach and cook for 1 minute. Add the ramen noodles and cook for another minute. 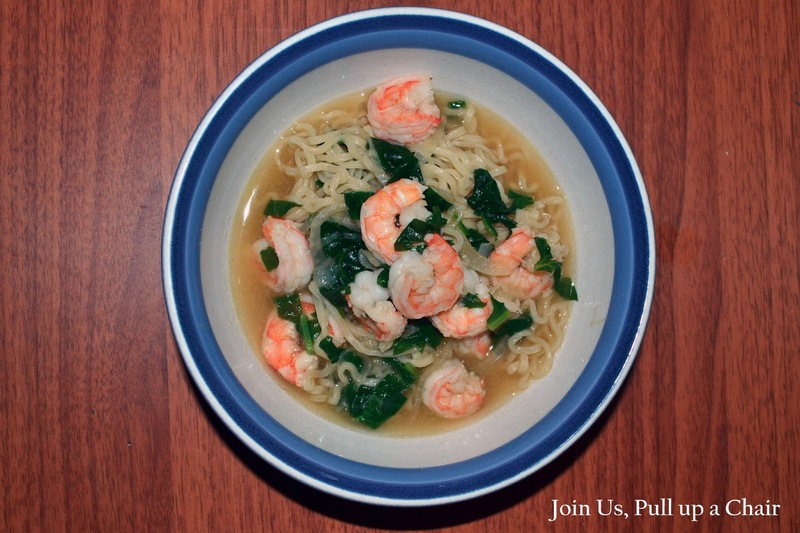 Finally add the shrimp and cook until the shrimp are opaque and the ramen is cooked. Taste for seasoning and add another tablespoon of soy sauce. Divide between 4 bowls and serve. Ok, I didn’t fall off the face of the Earth last week. I was just swamped with work and didn’t get time to blog about our meals. I’m also trying to empty out of our freezer to get ready for my next shopping trip to BJ’s warehouse. I made this last week and it was very good. I eliminated the cajun seasoning but used some Old Bay I had in the spice cabinet. I don’t do much cajun cooking, but this was a quick one pot dinner. Heat the butter, olive oil and garlic in a large non-stick skillet over medium0high heat until fragrant. Add the cajun seasoning and shrimp. Cook until shrimp begin to curl and then season with salt and pepper. Add the tomatoes and scallions and cook, continually stirring. Add the rice and 1/4 cup water. 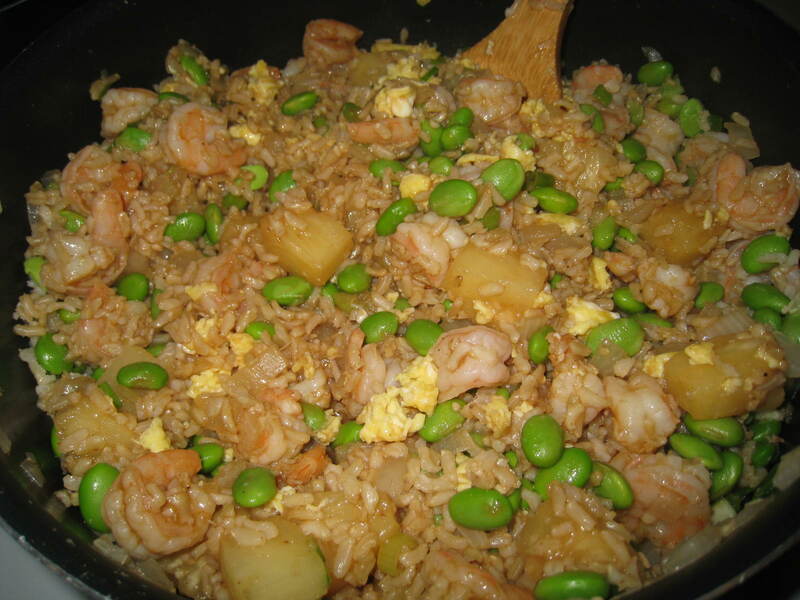 Continue to cook until the rice is warmed through and the shrimp are fully cooked, approximately 3 more minutes. Stir in the parsley and serve. This was a quick and easy recipe. 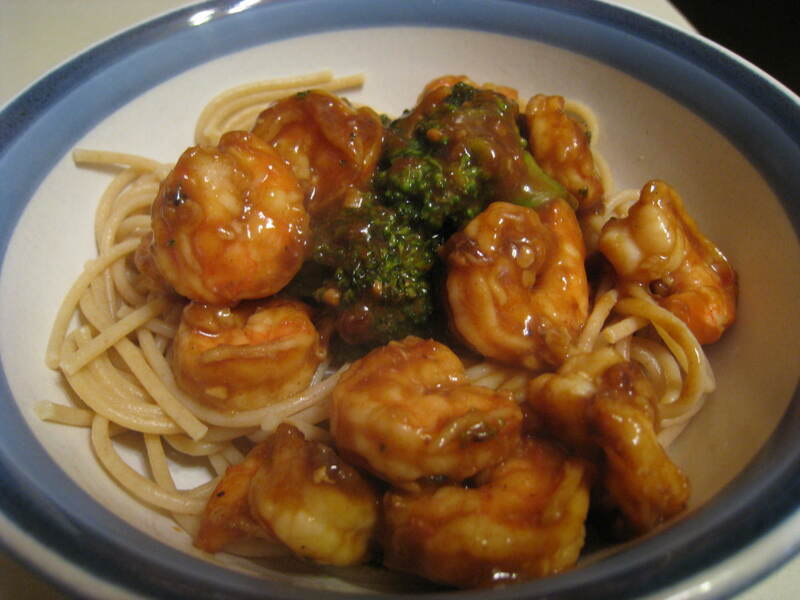 The sauce is very flavorful and my husband thought it tasted great as leftovers the next day. In a large saucepan, heat oil over medium heat. Add onion, cover and cook until soft for about 6 minutes. Add garlic and cook for 1 additional minute. Pour 1 cup of the chicken broth and the flour into a jar with a tight-fitting lid. Shake to blend well. Add the remaining broth and the broth-flour mixture into the pan, bring to a boil whisking constantly. Reduce the heat and simmer for 5 minutes. Stir in shrimp and cook for 3 minutes until shrimp are cooked. Stir in lemon juice, butter and parsley. 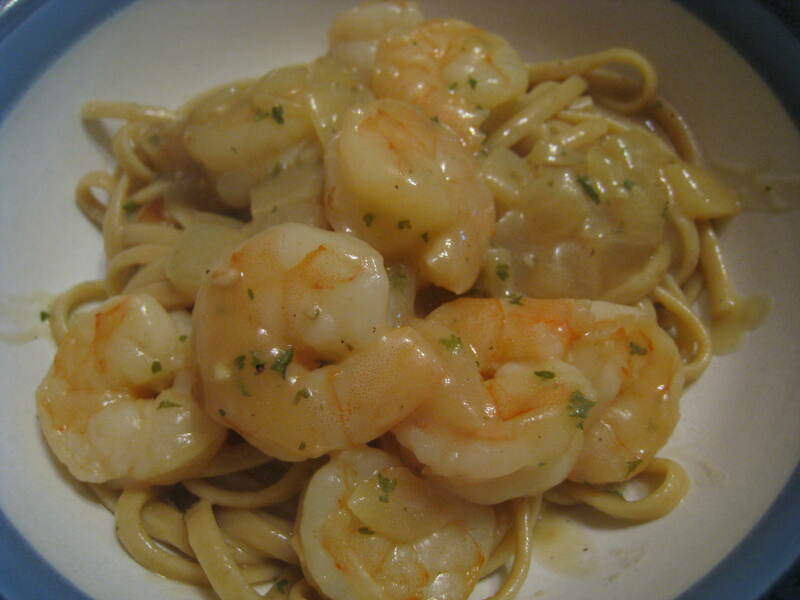 Pour shrimp and sauce over cooked linguine. I bought a bag of organic quiona a couple weeks ago and have been looking for a recipe to use it. I’ve never had it before, but have heard great things about it and it’s really good for you – high in protein. I was looking through the latest issue of Food Network Magazine and came across a recipe for Scallops with Citrus and Quinoa. Scallops were expensive so I figured I would substitute with grilled shrimp. I think the combination worked well, but didn’t care for the quinoa alone. I have some more and am going to try to work it into other recipes. Combine the quinoa, 2 cups water and 1/2 tsp salt in a saucepan and bring to a boil over high heat. Reduce the heat to low and simmer, uncovered until the water is absorbed, 12-14 minutes. Meanwhile, grate 1 tsp orange zest then juice the 3 oranges and 4 tangerines into a bowl. Sprinkle the sugar in a skillet and cook over medium-high heat until dark amber, about 5 minutes. Remove from heat and whisk in vinegar, citrus juices and zest and the coriander. Return to medium heat and whisk in butter; keep warm. Season shrimp with salt and pepper. Place on a greased heated grill/grill pan and cook until pink. Fluff the quinoa with a fork and divide among 4 plates. 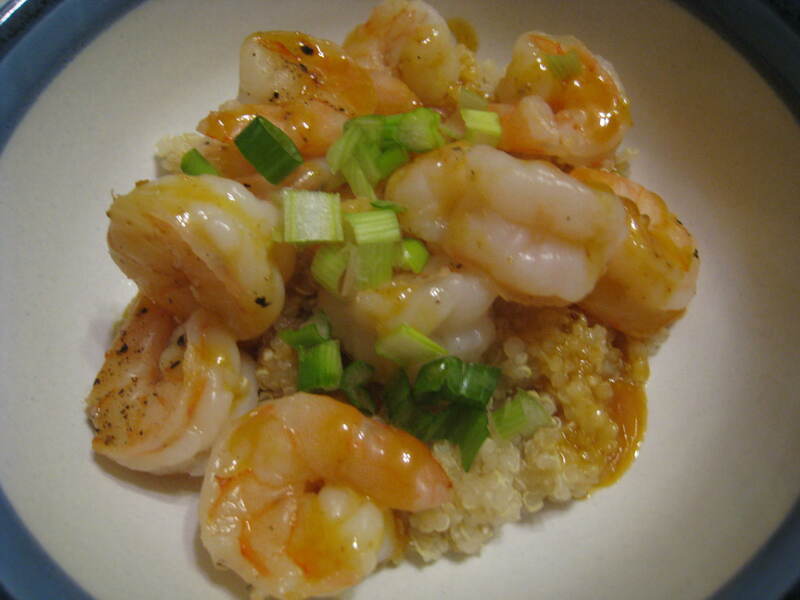 Top with shrimp and sprinkle with the citrus sauce and sprinkle with desired herbs.